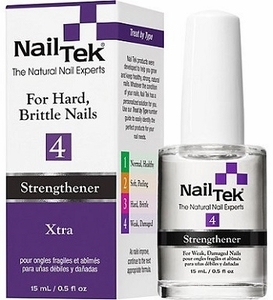 Nail Tek Extra 4 Nail Strengthener, .50 fl. oz. Nail Tek Xtra 4 is a highly effective treatment designed for weak or damaged nails that are resistant to conventional therapies. This concentrated formula provides the extra strength necessary to correct severe nail weakness or damage. Nail Tek Xtra is the answer for nails previously thought to be unsalvageable.